I often find myself wondering about God’s involvement in those things that happen to us that seem to have no connection to God. For example did God cause the recent wild fires in the Smoky Mountains? Did God cause my troubled heart? Did God give me pulmonary fibrosis? Does God cause hurricanes, tornadoes, floods, earthquakes? Does God cause a person to become so angry he or she kills someone? Did God cause Caesar Augustus to declare everyone to register in their place of birth? I’m not sure whether God is the ultimate causer of all that happens to us and our world or He is the ultimate opportunist. All I’m really sure of is when I need Him the most God is always there for me giving to me and for me His very best. When I stop and consider the circumstances and events that put Mary, Joseph, and the birth of Jesus where it needed to take place I know God is in the business of grabbing every moment and circumstance to give His very best. And while the questions I posed above continue to linger and challenge me I will continue hold on to my own belief that God is the ultimate opportunist. 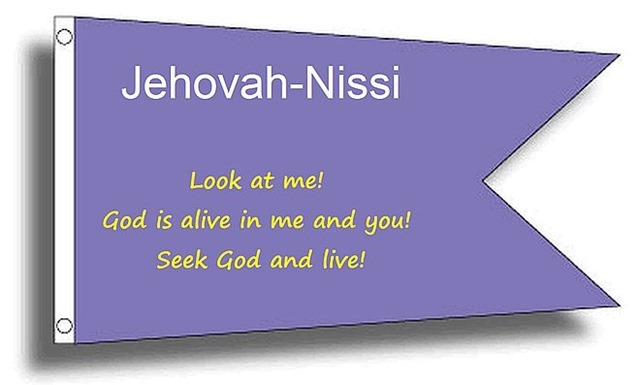 One of the Old Testament names for God was Jehovah-Nissi, the LORD is my Banner. The LORD is my Banner and on my Banner are these words: Look at me! God is alive in me and you! Seek God and live!